A tradition that was started years ago by the Episcopal Church Women is now carried on by the Alpha Phi Chapter of ESA. ESA offers affordable, repurposed flower arrangements for Memorial Day cemetery decorating. 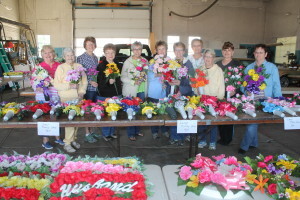 When the church ladies decided they did not want to tackle the process any longer, they approached Alpha Phi chapter to see if they wanted to take over. So the ESA chapter has been carrying on the tradition for over 14 years. Government offices in Winner will be closed on Monday, May 30, in observance of Memorial Day. The Tripp County Courthouse will be closed as well as the Tripp County Library. The city of Winner office will be closed. All state and federal offices in Winner will not be open on Monday. There will be no mail delivery on Memorial Day and the Winner Post Office will be closed. Financial institution in Winner and Colome will not be open for business on May 30. There will be no noon meal served at the Winner Seniors Citizens Center on Memorial Day. Southern Plains Behavioral Health Services and Main Gate Counseling will be closed Memorial Day. Anthony Husher of Winner, a member of the Dakota Wesleyan University golf team, has been named to the all-Great Plains Athletic Conference team. Husher earned his first GPAC honors after finishing tied for 18th in the GPAC with a score of 311. 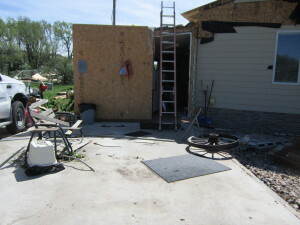 Severe storms that crossed South Dakota on Sunday led to reports of some tornadoes. The National Weather Service says a tornado in Tripp County Sunday evening caused the loss of farm building and power lines down. Rick Petersek, who lives east of Colome, lost a barn and the storm flipped over a semi. The power was off in Colome for about three to four hours and the strong winds ripped power poles. Rosebud Electric Cooperative of Gregory reported they lost five transmission poles north of the Colome Substation. This same lines feeds power to the Hamill area and residents in this area of Tripp County were also without power. The power went off around 8 p.m. and the power was restored around midnight. REC says in their whole system they lost between 15 to 20 poles that were hit by lighting or blown down by the wind. 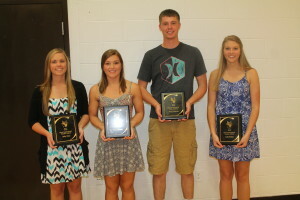 Many awards were presented to Winner High School athletes at the athletic awards night on May 17. Hayley Halverson was named the outstanding senior athlete. Named as senior most inspirational for the males was Devon Leiferman and the co-most inspirational for the females were Bailey Volmer and Kylie Horstman. The Bill Pistulka Friend of Athletics award went to Cyndy DeMers and Marsha Risseeuw was named the outstanding quarterback club member. Winner High School boys and girls track teams made a clean sweep of the Region 7A track meet in Winner. 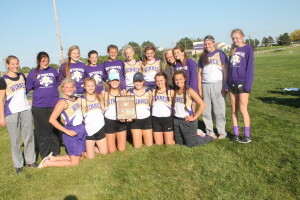 On a day dominated by the wind, the Warriors and Lady Warriors were also pretty dominate winning both team titles on the way to setting several new meet records. 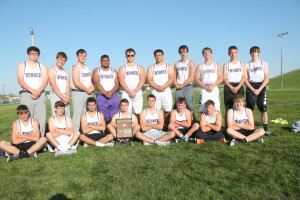 The boys won the title with 236 points and the girls took home the championship plaque with 203 points. 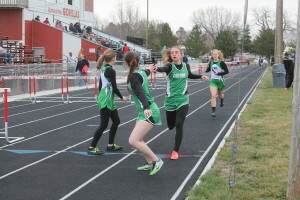 Jaclyn Laprath won the 3200 meter run and Kaydee Heath won the 300 hurdles at the Region 6B tournament in Gregory on Thursday. Reed Harter threw a shutout in five innings as the Winner/Colome baseball team defeated Chamberlain 13-0 in the first round of the playoffs on May 16 at Leahy Bowl. Harter had 13 strikeouts. 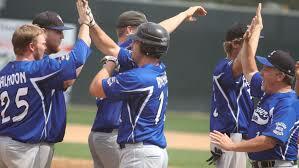 The Royals scored two runs each in the first and second innings, 4 runs in the third and 5 runs in the fourth inning. 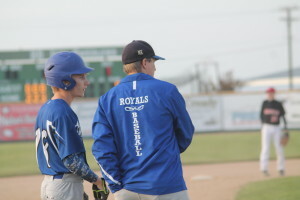 It was a matchup of the top Class A and Class B teams in the state as the Winner/Colome baseball team faced Mitchell last Wednesday at Cadwell Park in Mitchell. Mitchell won the game 12-2 in five innings. This was the first loss for the Royals. 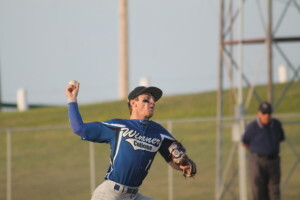 The Winner/Colome Pheasants amateur baseball team spit a pair of games with Parkston on Sunday in Sunshine League play. The games were played in Parkston. Parkston Mudcats won the first game 2-1 and Winner/Colome won the second game 5-3.